The wait is over! 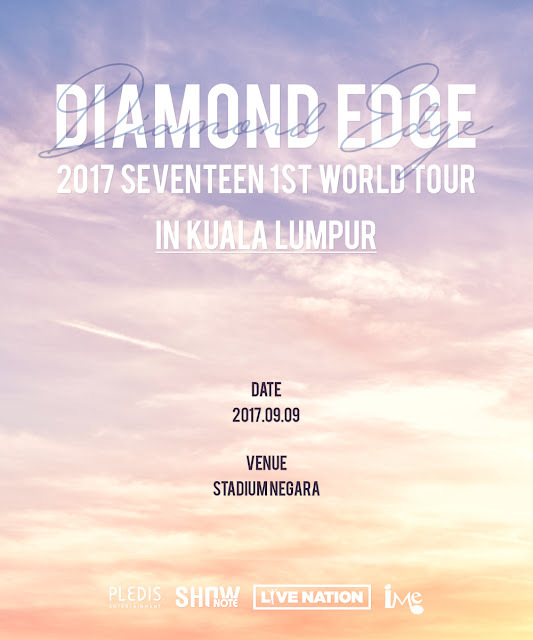 Korea uprising boyband, Seventeen will make their way to Malaysia this coming September for their first world tour, 2017 SEVENTEEN 1st World Tour "Diamond Edge" in Kuala Lumpur! Debuted in 2015 under Pledis Entertainment, Seventeen has been gaining much attention both domestically and internationally. The organiser, IME Malaysia will be bringing Seventeen to Kuala Lumpur on 9 September 2017 at Stadium Negara for their first world tour due to popular demand. Seventeen consists of 13 members S.COUPS, JEONGHAN, JOSHUA, JUN, HOSHI, WONWOO,WOOZI,DK, MINGY,THE8, SEUNGKWAN,VERNON and DINO. SEVENTEEN made to Billboard’s World Album Charts right after the release of "17 Carat" album, which proved an amazing achievement for a rookie group back then. On top of that, their first solo tour's tickets were sold out within 1 minute in Korea! The boys continue to rise to fame in the following years with several major achievements such as ‘Best World Performers’ at Mnet Asian Music Awards, ‘Disk Bonsang” at 2017 Golden Disc Award, and more! SEVENTEEN即将来马举办SEVENTEEN 1ST WORLD TOUR "DIAMOND EDGE" 巡演 ! is there any giveaway / contest for diamond edge ? ?